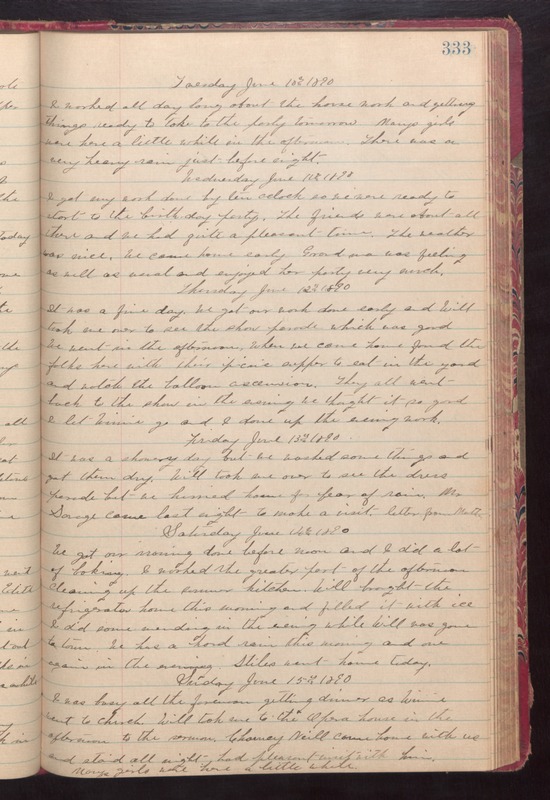 Tuesday June 10th 1890 I worked all day long about the house work and getting things ready to take to the party tomorrow. Marys girls were her a little while in the afternoon. There was a very heavy rain just before night. Wednesday June 11th 1890 I got my work done by ten oclock so we were ready to start to the birthday party. The friends were about all there and we had quite a pleasant time. The weather was nice. We came home early. Grandma was feeling as well as usual and enjoyed her party very much. Thursday June 12th 1890 It was a fine day. We got our work done early and Will took me over to see the show parade which was good. We went in the afternoon. When we came home found the folks here with their picnic supper to eat in the yard and watch the balloon ascension. They all went back to the show in the evening. We though it so good I let Winnie go and I done up the evening work. Friday June 13th 1890 It was showery day but we washed some things and got them dry. Will took me over to see the dress parade but we hurried home for fear od rain. Mr [Savege?] came last night to make a visit. letter from Mother. Saturday June 14th 1890 We got our ironing done before noon and I did a lot of baking. I washed the greater part of the afternoon cleaning up the summer kitchen. Will brought the refrigerator home this morning and filled it with ice. I did some mending in the evening while Will was gone to town. We has a hard rain this morning and one again in the evening. Stiles went home today. Sunday June 15th 1890 I was busy all the forenoon getting dinner as Winnie went to church. Will took me to the Opera house in the afternoon to the sermon. Chauncey Neill came home with us and staid all night had a pleasant visit with him. Marys girls were here a little while.